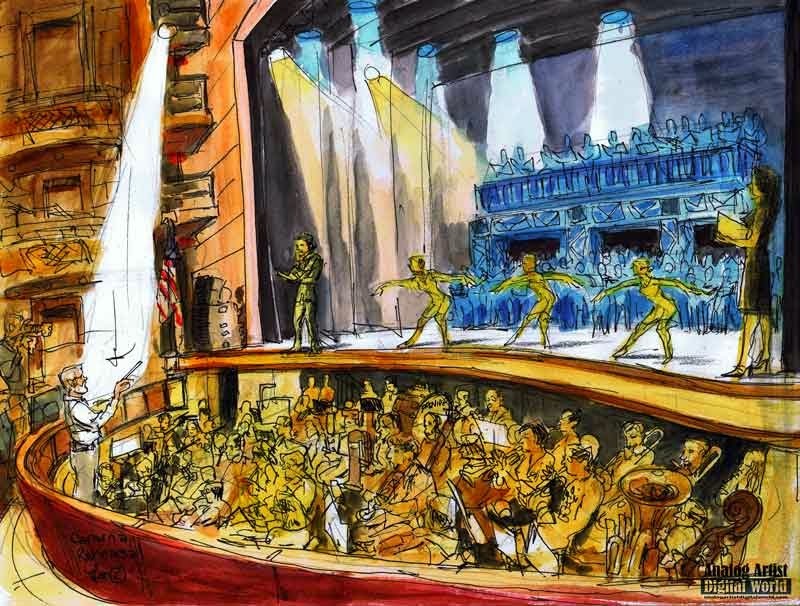 Analog Artist Digital World: Carmina Burana swept into the new Dr. Phillips Performing Arts Center. Carmina Burana swept into the new Dr. Phillips Performing Arts Center. I went to a dress rehearsal for Carmina Burana at the new Dr. Phillips Center for the Performing Arts. I was told to enter the stage door which is off Anderson Street. This was my first time in the brand new building. I nervously asked a security guard if I needed to sign in but he just pointed me up a stairway. The stage door opened up leading me right back stage. Dancers were stretching and nervously waiting for the run through of the show to start. Hundreds of singers were on stage standing in bleachers and on a second level balcony. I searched for the entrance to the auditorium seating and got lost with one of the dancers who was doing the same. I felt a bit more at ease knowing this new venue was also new to the performers. The show features The Bach Festival Society of Winter Park and the Orlando Ballet as they re-mount the acclaimed 2013 performance of Carl Orff's Carmina Burana for one night only, during the Grand Premiere of the Dr. Phillips Center for the Performing Arts presented by Dr. Phillips Charities and Balfour Beatty Construction. This program marks the third time the Bach Festival has presented this work as a joint choral–ballet presentation, first in 1992 with Southern Ballet Theater and the second in 2013 with the Orlando Ballet. The Bach Festival Society has performed this work as a concert piece several other times since 1990 under John Sinclair’s baton, as well as with the London Symphony Orchestra in 2009. Three noted vocal soloists are singing with the Bach Festival Choir, Youth Choir, and Orchestra on this program: soprano Julia Foster, tenor James Hall, and baritone Gabriel Preisser. Robert Hill, artistic director of the Orlando Ballet, is the choreographer for this performance. From my front row seat, I got a fabulous view of the large orchestra pit. One of the French Horn players, Kathy Thomas waved to me from the pit. Robert Hill greeted me and talked about how exciting it was to be in the new space. I felt at home, althouch the sketch was a challenge. John Sinclair was in the spotlight. What makes the theater impressive are the many booth seats that are stacked along the side walls of the theater. It isn't a particularly large or ornate theater but the eyes are drawn upwards towards the high ceilings. The chorus was still "on book" and John scolded them to memorize the music before the performance. My wife sang Carmina Burana and it is challenging to memorize. The hundreds of voices combined with the ballet was mesmerizing. The dark sometime sinister music has been used again and again in movies so it's driving theme is instantly recognizable. Male dancers supported female dancers making them appear to leap forward and backwards, weightless and in slow motion. This is an incredible performance to christen the new space. There was only one performance of the show on November 22nd at 7:30pm. It must have been magical and overwhelming with a full house. It felt nice to execute my first sketch in the new space. I hope it is the first of many.